Make, Play and Discover with the Nintendo Labo™! The Toy-Con 03: Vehicle Kit puts you in the driver’s seat of a car, submarine, and plane! 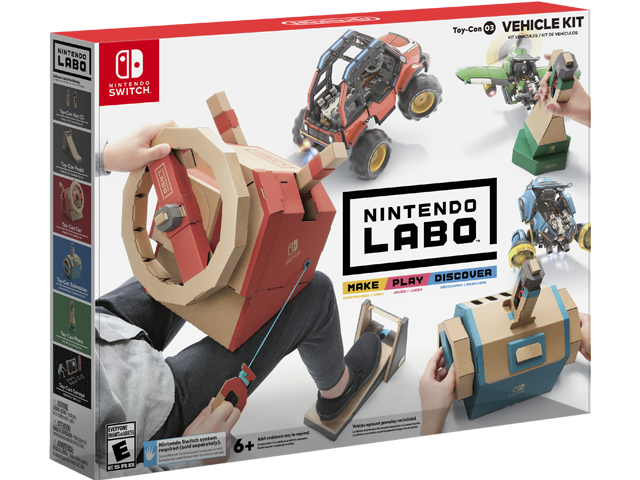 Nintendo Labo is an innovative line of family-friendly DIY kits for the Nintendo Switch™ gaming system. Make customizable cardboard creations called Toy-Con, play fun games with them, discover how they work, and invent new ways to play. All required building materials and accessories are included, and each kit’s unique packed-in Nintendo Switch software provides interactive build instructions, games, and more — all you need to add is a Nintendo Switch console and its pair of Joy-Con™ controllers*! See your creations come to life as you speed through races, battle special cars equipped with extendable punching arms, explore and interact with a mysterious world, and more. Get ready for hours of engaging, inspiring, family-friendly DIY fun! Rubber bands are made of natural rubber (latex).